shops later this week. Follow me on Etsy or Craftsy to be notified when I upload new patterns. More about my new pattern below. But first! Did you notice my new blog header!? Gingham Dog and Calico Cat Quilt designed, pieced and quilted by Anita LaHay of Daydreams of Quilts. Made with "April Showers" by Bonnie and Camille for Moda Fabrics. First, let me begin by thanking my friend Lori of SewPsychd for gifting me the fabrics I used in the quilt. Aren't they lovely!? For the longest time I couldn't think what to make with them and one day I was flipping through the book pictured below that my Mom gave to me years ago. Then it struck me that a Gingham Dog and Calico Cat quilt was the perfect use for these "April Showers" fabrics that have gingham and calico prints among them. I do like the quilt above and I do enjoy embroidery but just now in my life I did not want to embroider 12 dog and cat faces. :) So I designed a quilt using dog and cat silhouettes. Close-up of Gingham Dog and Calico Cat Quilt. I seem to have quite a lot of this "April Showers" fabric in my stash so I had enough on hand for the backing and binding as well. UpCraft Club is launching my pattern today. They have it on sale for today and tomorrow for 20% off! You can find it here. On July 20th this pattern will be available in my online shops as well. I hope you will enjoy my new pattern! This pattern makes a generous crib/toddler bed quilt at 43" x 54.5". There are suggestions for ways to size the quilt up if you prefer a larger quilt. 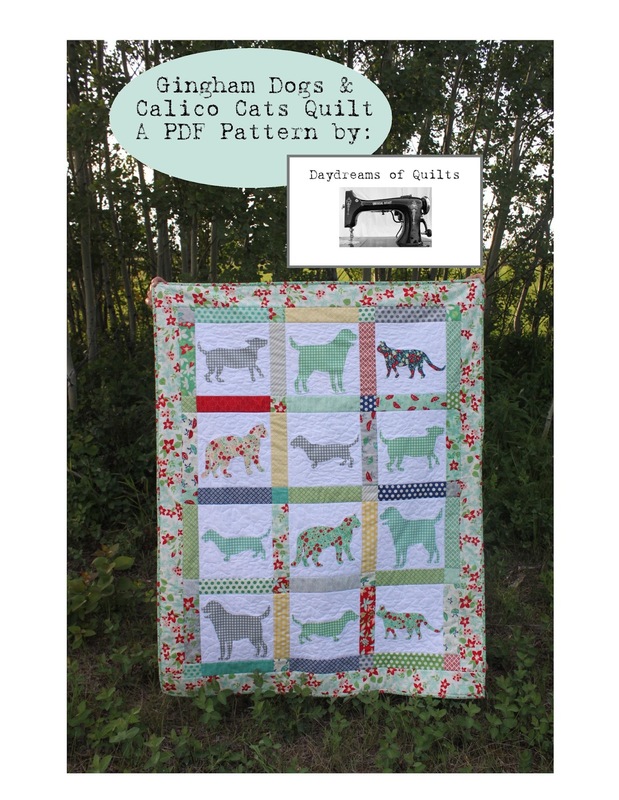 The pattern includes three dog and two cat applique templates, a quilt layout diagram and a quilt coloring page along with instructions and fabric requirements for the toddler bed quilt. Use a bundle of fat eighths (there will be leftovers for another project) or a combination of fat eigths and 2.5" strips to make your quilt.